This post is both Tuesday AND Wednesday's news. Our first day back from vacation Tuesday and I forgot the camera. The volunteers were all cheering that news except there are plenty of pictures of them from other days. 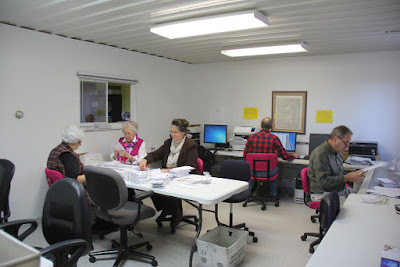 Tuesday volunteers were Marvin, Marie, David, Kathy, Glenna, Eva Jean, Vonnie, Shirley and Joyce. Timmy, Marie's son also helped with collecting all the garbage and hauling it out. We had an abundance of mail. 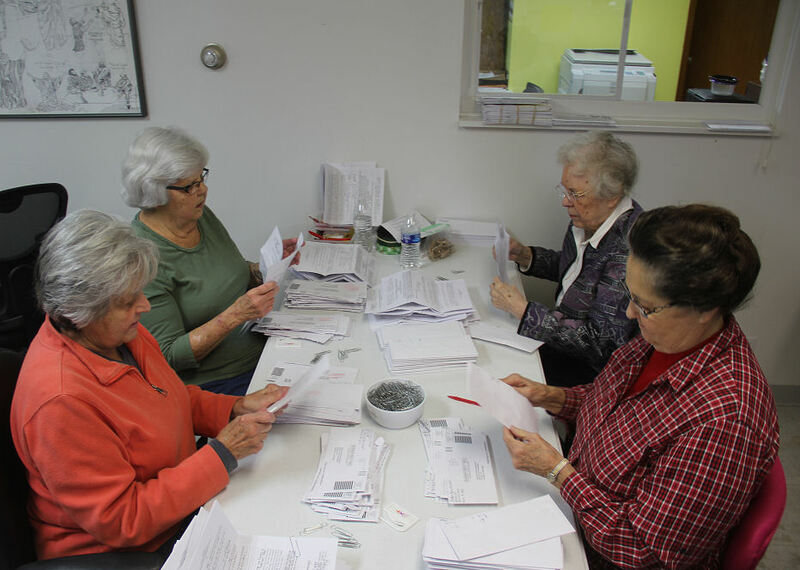 Glenna, Shirley, Vonnie and Eva Jean worked on opening that while Joyce (not pictured) worked on applying labels to envelopes. Marie worked on the computer. Chuck also applied labels, while Marvin, Kathy and David read the letters. We had a very productive day quitting at noon. 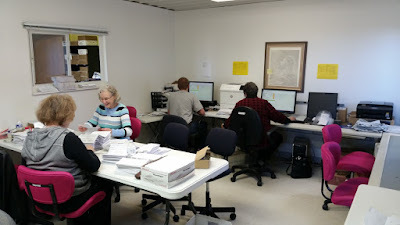 We enjoyed lunch then straightened up the office but left the unfinished studies for the Wednesday group. On Wednesday we had Mary, Carol, David and Cindy come in. Mary and Carol opened the studies while David B and Cindy entered Bible requests. By the time we needed to leave all the studies were opened, some of them were processed, all of the letters were read and processed and the Bible labels printed. These 4 were wonder workers as this was a lot of mail. Don't worry Thursday group we left PLENTY of work for YOU. 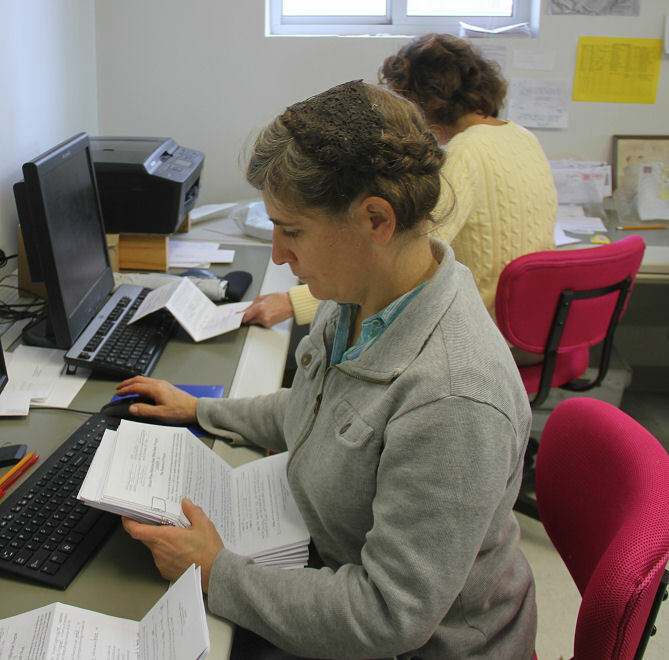 There are 162 Bibles to stuff, wrap and label, hundreds of studies all needing to be processed. 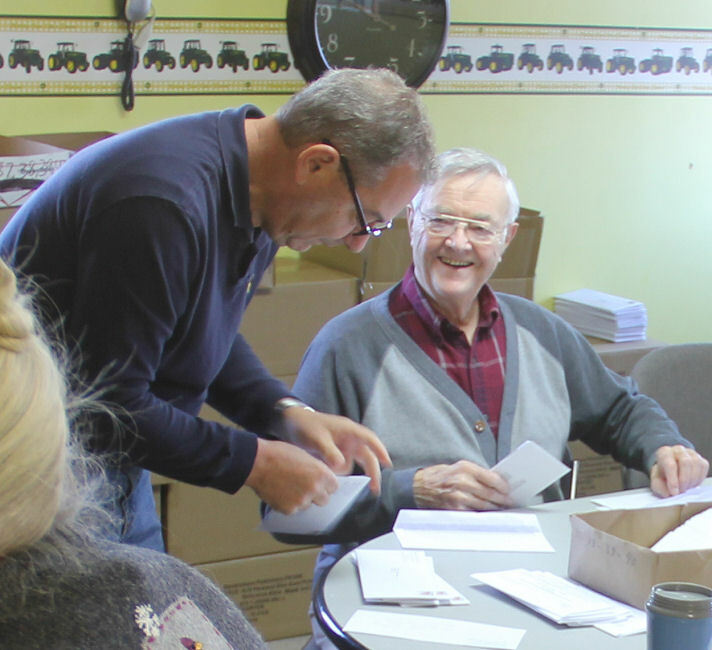 How thankful I am to have such wonderful willing volunteers to help with this huge program which now has OVER 65,000 people on the rolls.